Are you the Silent Samurai the lost people have been waiting for? Click here to play! Find out for yourself when you attempt to take on the massive slot jackpot on offer at this exciting slot. 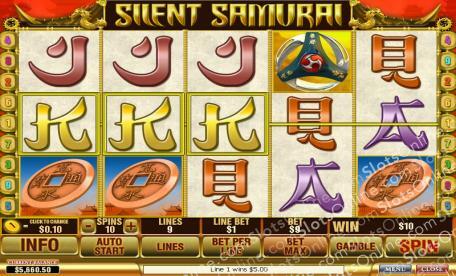 Silent Samurai is a thrilling 5-reel slot that is played across 9 pay lines, where the more lines activated means you have more chances for making winning combinations. The Dragon is Wild and can be substituted for any other symbol on the reels except Scatters to finish winning combos. The Scatter is the Geisha, and landing three or more anywhere on the reels will earn you a payout. There are also two exciting bonus features including the Gamble option after every win, and the chance to win up to 27 Free Spins! The Silent Samurai call is waiting for you to take it, so slide on down to this wonderful slot today and start slashing your way to incredible payouts! The Geisha is Scattered and when she appears anywhere on the reels up to three or more times you will be rewarded with a payout. Dragons are Wild and can become any other symbol when winning combinations need to be completed.